If you had knee replacement surgery and have received a NexGen knee implant and had to undergo revision surgery due to problems including: loosening of the implant, pain, infection or difficulty walking you may have important legal rights. There currently is a limited NexGen knee recall for a specific tibial component, however according to some patients and critics there have been problems related to the Zimmer NexGen replacement. In September 2010, Zimmer, Inc. announced a NexGen knee replacement recall of a specific tibial component of the Zimmer knee implant. This Zimmer NexGen recall is only for a specific component piece, however some research has revealed a higher than acceptable failure rate involving the Zimmer knee and some doctors have expressed their opinion that there should be a general Zimmer NexGen knee recall. It is estimated that since 2003, the NexGen knee replacement has been implanted in more than 150,000 patients. This potential recall would only affect a relatively small number of patients who had knee surgery since 2003 and where the recalled tibial plate was used. Some patients have already reported experiencing knee implant problems including: serious or ongoing pain, infection, swelling and loosening or dislocation of the implant. Infection – Areas in the wound or around the new joint may get infected. It may happen while you’re still in the hospital or after you go home. It may even occur years later. Minor infections in the wound are usually treated with drugs. Deep infections may need a second operation to treat the infection or replace the joint. Blood clots – If your blood moves too slowly, it may begin to form lumps of blood parts called clots. If pain and swelling develop in your legs after hip or knee surgery, blood clots may be the cause. The doctor may suggest drugs to make your blood thin or special stockings, exercises, or boots to help your blood move faster. If swelling, redness, or pain occurs in your leg after you leave the hospital, contact your doctor right away. Loosening – The new joint may loosen, causing pain. If the loosening is bad, you may need another operation. New ways to attach the joint to the bone should help. Dislocation – Sometimes after hip or other joint replacement, the ball of the prosthesis can come out of its socket. In most cases, the hip can be corrected without surgery. A brace may be worn for a while if a dislocation occurs. Wear – Some wear can be found in all joint replacements. Too much wear may help cause loosening. The doctor may need to operate again if the prosthesis comes loose. Sometimes, the plastic can wear thin, and the doctor may just replace the plastic and not the whole joint. Nerve and blood vessel injury – Nerves near the replaced joint may be damaged during surgery, but this does not happen often. Over time, the damage often improves and may disappear. Blood vessels may also be injured. Use of the dialysis products, GranuFlo® and NaturaLyte® has been linked to an up to six-fold increase in the risk of cardiopulmonary arrest and sudden cardiac death. The manufacturer, Fresenius Medical Care (FMC), was aware of the injuries and dangers associated with their dialysis products but failed to warn patients and doctors until 2012. The result has placed more than half of all dialysis patients in the United States at risk and set the stage for imminent GranuFlo lawsuits. FMC officials decided to hide, mislead, and obscure information about patient safety hazards in order to maintain their market share-putting profits ahead of patients’ safety! The company’s slow response placed more dialysis patients at risk even though evidence was crystal clear: high pre-dialysis serum bicarbonate levels created a risk of cardiac arrest and deaths. You, and your loved ones may have suffered-or are currently still at risk! It is estimated that 3,300 dialysis clinics, servicing approximately 260,000 dialysis patients, are currently using these potentially harmful formulations. On March 29, 2012, the U.S. Food and Drug Administration (FDA) issued a Class 1 recall of GranuFlo and NaturaLyte, dialysis products manufactured by Fresenius Medical Care. The use of either product can result in high bicarbonate levels that can cause metabolic alkalosis-a significant risk associated with low blood pressure, hypokalemia, hypoxemia, hypercapnia, and cardiac arrhythmia, which may culminate in cardiopulmonary arrest and death. Class 1 recalls are the most serious type of recall and involve situations in which there is a reasonable probability that use of these products will cause adverse health consequences-or death. Cardiac death is recognized as the number one cause of death for dialysis patients, accounting for 59% of those deaths. By 2010, the medical community had concluded that these cardiovascular-related deaths were not due primarily to atherosclerotic (plaques and arterial stiffening) disease, but rather uremic cardiomyopathy, characterized by left ventricular hypertrophy (LVH), LV dysfunction, and LV dilatation. This conclusion caused many in the medical community, including FMC, to research the issue-possibly a little too late to prevent GranuFlo® and NaturaLyte® related injuries. There are currently more than 5,700 dialysis centers providing service to approximately 400,000 dialysis patients in the United States. FMC, the largest dialysis services and products company in the U.S. and the world, not only owns thousands of dialysis clinics, it also manufactures nearly all the medical products used in dialysis care. GranuFlo is an acid concentrate powder product that allows dialysis clinics to mix their own acid concentrate solutions, which helps lower shipping costs and storage space associated with traditional 55 gallon drums. Its formulations are the only marketed products to contain the “dry” powder form of acetic acid, sodium diacetate. Because GranuFlo uses sodium diacetate, it doubles the amount of acetate in dialysate compared to formulations made with acetic acid. FMC also sells traditional, pre-mixed, liquid acid concentrate formulations under the brand name NaturaLyte. In response to the high rate of cardiac arrests that occurred in Fresenius Medical Care clinics in 2010, the company submitted an internal memo to its own dialysis clinics on November 4, 2011. After the FDA received an anonymous copy of the November 4th internal memo, company executives were forced to issue an urgent public product warning and recall to its customers that GranuFlo and NaturaLyte were associated with elevated bicarbonate levels and an increased risk for cardiopulmonary arrest and sudden cardiac death. 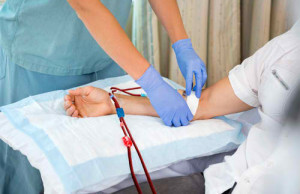 FMC conducted a case-control study that evaluated risk factors in hemodialysis patients who suffered from cardiopulmonary arrest in FMC facilities compared to other dialysis patients within the same facilities between January 1 and December 31, 2010. This study identified 941 patients in 667 FMC facilities who had cardiopulmonary (CP) arrests within the facilities. Looking at the data for these 941 patients, the study found that the patients’ risk of cardiopulmonary arrest was up to six times higher if they had an elevated pre-dialysis bicarbonate level. According to the memo, FMC was aware that there was a significant increased risk of cardiac arrest and death during hemodialysis treatments associated with their GranuFlo and NaturaLyte dialysis concentrate products that contain sodium diacetate. The memo recommends action for patients with elevated pre-dialysis bicarbonate levels. However, FMC only provided this memo to FMC’s doctors and dialysis facilities, and not to non-FMC physicians and clinics that were using products-despite the fact that over 100,000 dialysis patients were receiving products at non-FMC facilities. FMC only decided to share its knowledge with the thousands of non-FMC physicians and clinics on March 29, 2012, after a copy of the November 4, 2011 internal memo was leaked to the FDA. Even then, FMC did not share all of its information. What was provided was a scientifically-ambiguous, two-page memo that lacked details and the urgency of the FMC internal memo. A key point: the March 29 memo did not mention patient blood levels or the most at-risk population of all, “acute” dialysis patients-and only included one of ten medical references that the FMC internal memo did. If you suspect that you or a loved one has been injured by one of these two dialysis drugs, contact the Los Angeles Auto Accident Attorneys immediately. Our Los Angeles pharmaceutical injury attorneys can keep you advised on further investigations and the action to take in a lawsuit. As industry leaders with decades of experience successfully prosecuting injury cases and recovering large financial awards, the Denver personal injury attorneys of the Los Angeles Auto Accident Attorneys have the expertise to provide just compensation for individuals who have suffered injuries as the result of GranuFlo® and NaturaLyte®. If you or a loved one has suffered from cardiac arrest, heart attack, or other illnesses following dialysis, we can help you assert your legal rights and will fight aggressively on your behalf.